THIS SUNDAY! 5 PM! Don’t miss it. Going to be AWESOME! Comments Off on THIS SUNDAY! 5 PM! Don’t miss it. Going to be AWESOME! Four days from today, December 4th, there is going to be a fundraiser movie for John Russell at the Treehouse Cinemas in Gulf Breeze at 5:00 pm. It’s a free event, donations to help out with John’s ongoing medical expenses, are welcomed. We hope to pack the house for this event, so come out and show your love and support for John Russell. 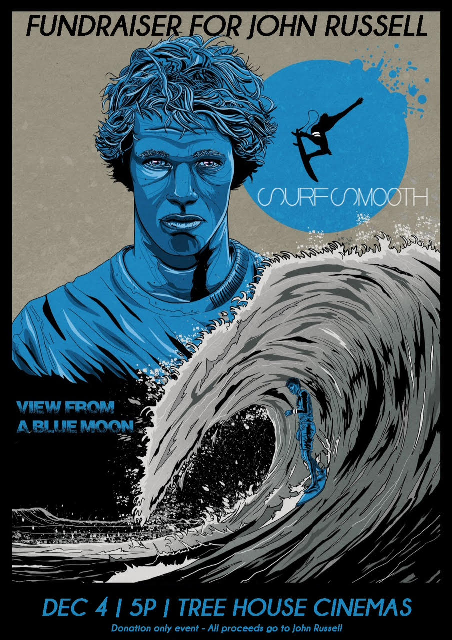 Thanks to Nathan Pooley and Ben Martin who were able to get permission to show this newly released surf film, “View From A Blue Moon”, it has had great reviews, so this should be an awesome evening to come out with family and friends, to help support John. See you there! About the movie: See the sport of surfing as it’s never been captured before in John Florence and Blake Vincent Kueny’s second signature release, this time in association with the Emmy award-winning production company Brain Farm. The first surf film shot entirely in 4K, View From a Blue Moon follows the world’s most dynamic surfer John Florence and his closest friends from his home on the North Shore of Oahu to his favorite surfing destinations around the globe. From the dreamy blue perfection of the South Pacific to the darkest uncharted waters of Africa (and everywhere in between), Florence faces a broad spectrum of emotions as he continues to seal his legacy as one of the most gifted surfers ever. And while the young Hawaiian is pulled in increasingly different directions, there is no form of pressure that will keep him from his ultimate goal — to redefine what is possible in the ocean.